I think you're mistaken. That's the love child of Shaggy and Velma from Scooby Doo. By the way, I'd like to be that dweeby-looking guy. These fine folks are members of the rock band, Jetpack UK. I don't know that Shaggy or Velma would claim that guy! Maybe you wouldn't mind being a member, but I don't know that you would want to look like any of those guys. It's funny that they happened to be a band, because when I was looking at the picture I was thinking it looked like an album cover. Remember when I posted this photo belonging to a member on Flickr? Ah yes, another weird attempt to lure people to the shreveport riverfront by building a makeshift peer. What was the point of this thing anyways? If it was intended to have people dock their boats....then why would people do that when theres not much businesses on the shreveport parkway? (other than the casinos). This would be better suited for the Boardwalk behind the Bass Pro shop and let people dock their boat and go get whatever fishing stuff they need and then go back to fishing. Youd have thought they would have done this by now. Well, yeah, that's the point. It's so people can dock their boats and walk up to the park with their families. I see it used all the time. I've seen families dock their boats and take their children to Sci-Port as well as to play in the fountains. It's a great addition to the riverfront, but I wish they'd have made it a little larger and allowed the River Cruise boat to use it as well. That's one attraction that isn't often used because it's kind of tucked away in a corner. Allow them to use the boat dock and place their sign in a visible location. I sure wish the River Rose paddle wheeler was still around. That boat was a gem, and for a long time people utilized it. I jog down there a lot...ive NEVER seen a family come up, dock their boat and then walk up to the park or anything. I see some people fishing down there from time to time but thats it. Apparently it's a nice place to job since you go down there a lot. Maybe it's a jogging pier, not a boat dock. I've seen it numerous times. The Houseboat Adventures company also uses it sometimes. It doesn't get a ton of use, but does get plenty. I think it's a great asset to the riverfront. Allow people on the water the opportunity to tie their boats up and come up to the park or to Sci-Port. If I had a boat, I'd use it. I created a new cityscape banner for Shreveport's page on Emporis. I've been meaning to do this for a while, but just finished it today. I thought I'd share it with you guys. These banners are intended to be a bit abstract... an artist's depiction so to speak, so build placements are necessarily realistic. I sent the image to the Emporis website administrators to have it added. Hopefully it's up soon! Nice! I've looked at other cities' banners and they all have this abstract look. I like it. Stephen, do they give you a template banner to build on or did you have to create it from scratch? They provide a template for Photoshop that has layers setup for all possible backdrops and times of of the day. Then you have to build it from actual building photos. I chose night time b/c I wanted to showcase the neon lights. Did you notice the rose sculptures? Very cool, I figured there must be a template since so many cities' banners are pretty similar. Oh yes, I noticed the roses... they stand out! Well, as it turns out, they're phasing out nightscapes so I'm going to have to redo it!! That could take some time. Really? They all look cool as hell. Dude that's talent that you did that! Nice detail; Very impressive back drop with The Horseshoe Casino hotel added to the Shreveport skyline. I wish I knew how to do that for Emporis. Thanks for sharing. My city will need a cityscape banner with the addition of some high-rise towers. Or I can just $pay you fridayinla. I should make one for Baton Rouge also! Can do Richy, no problem. 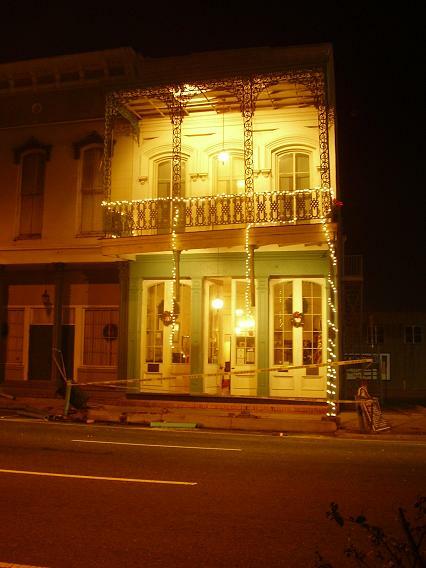 I had to start fresh on the Shreveport banner b/c Emporis no longer accepts night-time cityscapes. Remind me and I'll get to it next week! Thanks fridayinla, I really appreciate it. I'll try to remind you next week. SBC's riverfront has excellent nightime lighting!!! Those roses are cool looking too. Stephen is a great asset to Emporis, and I know he'll do B.R. proud, Richy! He's an asset to U.P. and SBC as well. Shreveport skyline - I softened and color-tinted this version in Photoshop using the method photographers use to soften portraits of people. That 'Chicago' sign and all those buildings next to it, which used to comprise Shreve Square, were shown for a couple of seconds on the NBC movie A Year Without Santa Claus when it aired last night. That is a nice pic above! I couldn't count on one hand the number of styles of architecture in that one pic. I especially like the wrought iron balcony on the right. 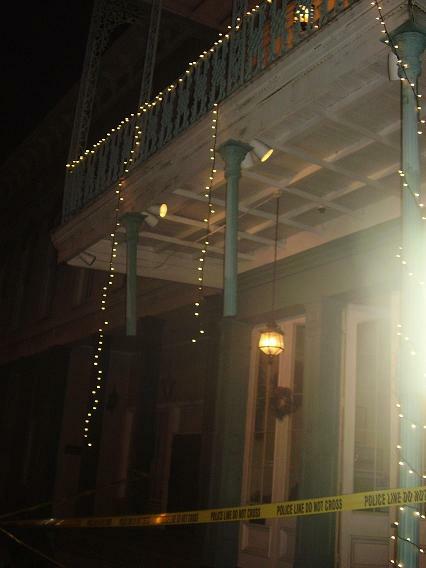 The caption for these photos says, "December 14, 2006 early in the morning a car took out three of the four posts holding up the balcony." Wow! Check out those busted posts! Imagine how drunk that person must have been... look how tall that curb is!!! I saw that this morning on the way to work!!!! cops were there and an suv was being pulled onto a flatbed truck! Someone had to be REALLY drunk!! The nightclubs are open on Wednesday nights, aren't they? Are they allowed to stay open until 6am on that night like on weekends? If so, I can see how this happened. I drive through downtown every morning at about 5:00am.. I have seen some pretty crazy things let me tell you!!!! I've seen people urinating on buildings leaving clubs.. I saw the accident scene the other day.. I've even seen a crime scene over near that one club I cant think of the name.. well there were people standing around some yellow tape a lot of police and a white sheet on the ground.. I don't want to know what was underneath... I've seen a crazy bag lady jump out in front of me on the bridge going across bayou.. she scared the crap out of me..